A flurry of novelty titles inspire interactive Easter fun. 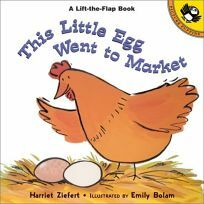 Youngsters follow the fate of two different eggs (one stays on the farm and hatches into a chicken; the other is boiled and ""decorated for Easter"") in the lift-the-flap offering This Little Egg Went to Market by Harriet Ziefert, illus. by Emily Bolam. This title may inspire children to swear off decorated eggs and opt for only chocolate ones.